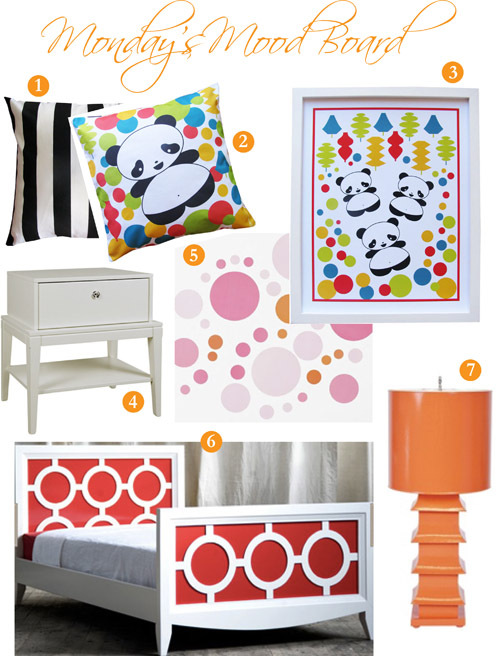 Monday's Mood Board - It's A Panda Party! -and- Introudcing Our New Junior Collection Now on ETSY - Piccola Casa!!! Oh My! I can’t believe it’s the middle of October already!!! It has been so busy at our studio these days, I have to remind myself to take time to go for walks and breathe deeply! I finally had the opportunity to put together a new Monday Mood Board and this time I’m keeping it really colorful and really fun! We just joined the ranks of all the other talented artists over at ETSY and this weekend we opened the doors to our new Junior Shop, Piccola Casa. Piccola Casa means Little House in Italian and since I grew up in a large Italian family, the name just seemed fitting. Let me introduce you to one of our new designs, Panda Party! Over in our new shop you can find my Panda Party pillow and art print as well as lots of coordinating items. I have many more items to add to Piccola Casa so I hope you will check back often. Now on to our Monday Mood Board!! Check out this amazing Regency Youth Bed I found over at LaylaGrayce. It comes in many colors and I am loving how fresh and new this design is. Of course you know I’m a fan of anything from Bungalow 5 and this perfect, modern Piedmont Side Table is available on their sister site, ZINC Door. Have you had a chance to look at the lighting collection over at Shop Ten 25? She has so many great selections over there it’s hard to pick one. Do you not love, love, love this Pagoda Lamp?!?! When I’m painting these little watercolors, I let my mind wonder. I don’t really know why I painted circles on the ground but it seemed like a fun idea and kid’s rooms should be fun! Wall Decals are so popular these days, like these from Pottery Barn Teen….walls, ground, where ever! So let the Panda Party begin!!! Please check out Piccola Casa and send me your ideas or suggestions. I’d love to hear from you!